Mermaid Week LIVE color-along broadcasts today! This week I was lucky enough to take a 3-day workshop from the talented Brenda Swenson – I learned so much and am grateful a few folks dropped out so I could take someone’s place from the waiting list! 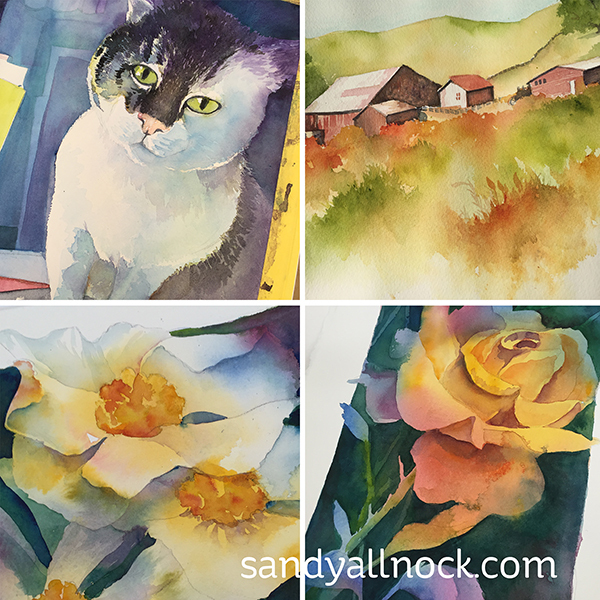 🙂 Brenda has a blog HERE, and you can get her watercolor DVDs HERE. Today I’ll be online live, coloring the Greeting Farm mermaids below – you can download the digis and get them printed out, and be ready to color! I’ll be using Copics but you can use whatever medium you want, of course. Your cat is precious. All the paintings are great. I found you by getting hooked on your mermaid cards! Delighted to see more of your fabulous work! The paintings are top notch..well done Sandy.I checked out Brenda’s website..Wow! I can see why there’s a waiting list.Huge talent. I’m hooked.Thanks Sandy.I’ll be popping in today and thanks again for all you do. Beautiful paintings, Sandy. Thanks for “sharing” Brenda. I checked out her blog, was instantly pulled in with her work and her story, and will be going back to read more about her (not to mention classes in Provence and Spain!). I’ll be checking in for your “live” color-alongs today! The roses are great. Thanks Sandy!